The evening-journeys back were even more relaxing since we were returning home. As the auto trundled over the Chetpat bridge, there was this ever-so-cozy feeling of nearing home. There were so many ways of returning home, buses, autos, cabs. And so many routes, all of them made so comfortable by the streetlights of Chennai and the fragrance of jasmine. Home is where I hang my hat, the American country singer Johnny Cash once sang. Home is where the heart is. It's the people who make a house a home. Every December evening in Chennai, we returned to K's family home, where her sister Lakshmi welcomed us back for dinner with a smile. We returned home to who we were. Those days, I never had a doubt that there would always be a home. It was K who made the house a home, whether Chennai or Bengaluru. She was so positive in everything she said and did, especially vis-a-vis me. She called me Rji, short for my Delhi cousins' reference to me as Raghuji. I once jokingly asked the maid to join me in shouting "K, K, down, down!". And K responded with an "Rji, up, up!" I remember a cousin's colleague dropping by at home with his little boy who had this habit of looking up at his father now and then, and saying "You are not my friend." Days later, I jokingly told K, "You are not my friend." and immediately stopped when I noticed the tears in her eyes. Even in a joke she took her commitment to me seriously. On her last stay in the Bengaluru hospital where she was being treated for multiple myeloma (cancer of the bone-marrow) and just days before the end, while she was still conscious, she rang up home one morning to speak to Mohana, the cook, which was something I heard about much later. "Mona," K said on the hospital-phone, "the day I go, you must prepare Rji's favourite dishes." Mona tried to stop her with an "Amma, don't talk like that." K continued, "On the day of the cremation, people will say no food should be cooked at home but you must quietly prepare Rji's favourite dishes without telling anyone." To put it simply, she cared for me. And so I hardly stir out of the Bengaluru apartment and stay at home with the memories of a life together and December holidays in a Chennai house which has been demolished and converted into an apartment-block after Lakshmi's demise. A German poet once wrote, "The lonely man will seek his loneliness". One can be alone for the rest of one's life without feeling lonely. 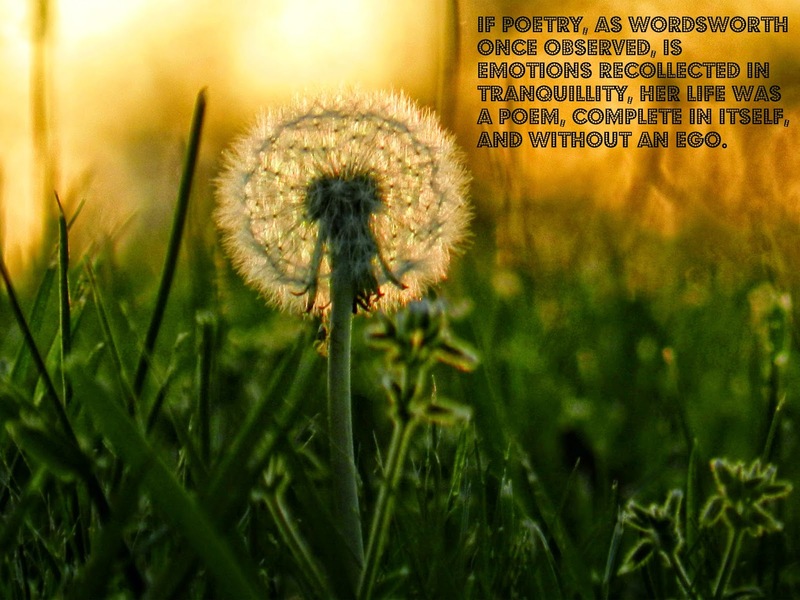 If poetry, as Wordsworth once observed, is emotions recollected in tranquillity, her life was a poem, complete in itself, and without an ego. Some 13 years ago, K and I had gone to Thiruvaiyaru for the Thyagaraja Aradhana where the leading Carnatic musicians assemble together to sing the saint-composer's pancharatna kritis or five great compositions on the day he attained samadhi. In the foyer of the Thanjavur hotel where we were staying, K noticed the Carnatic music saxophonist Kadri Gopinath and went up to him and greeted him. "Do you sing or perform on an instrument? ", he asked. "No," she said, "I am just a fan." And I remembered K and her friends telling each other how they would have liked to have worked as a maid in the house of the legendary M S Subbulakshmi just so that they could hear her sing. While writing this and sipping water from a tumbler where her initials--KRK--are inscribed, I realize that she could have married a much better person. I could not have found anyone better. About Raghu Krishnan: Raghu Krishnan is a senior journalist who is settled in Bangalore.